Theodore pushes Banvit through its first Turkish Cup title! 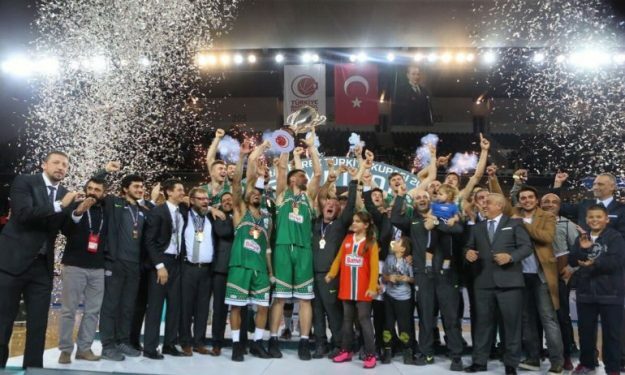 Banvit reached its first title in Turkey after beating Efes in the Turkish Cup final! Banvit reached its first Turkish Cup title by beating Anadolu Efes 66-75! Jordan Theodore led the winners with 19 points, 9 rebounds and 4 assists. Gediminas Orelik followed with 17 points, 12 points were contributed by Damian Kulig, while Jeremy Chappell and Gasper Vidman added 11 points each. Early in the game, Theodore and Vidimar paced their team, leading it 12-19 at 8′. Theodore managed to score 13 of his team’s points that led 32-38 at halftime. Efes tried to approach in the second half, yet their opponents stayed in charge, leading 44-52 after 30 minutes. Orelik pushed the deficit to 12 points midway in the final period and with less than 3 minutes left, Kulig expanded his team’s lead to 10 points again. Heurtel and Brown chopped again to 3 points, yet the leaders were able to stay calm and restore their lead.